My dad is SUCH a good Grandpa! Rhett's baptismal gown is very special. A dear friend of our family offered to make it from my mother's wedding gown. I asked her if I could also add touches from my own wedding day, and she agreed. The gown ended up with a few details added from my wedding gown and the tie Josh wore on our wedding day. The baptismal gown also had some gorgeous embroidery on the front, and the back had his initials and baptismal date. It is so beautiful, and we will certainly be using it for any future siblings Rhett might have. Josh decided to be the one to baptize Rhett, which was a great experience for him. I don't know for sure how common it is in our church for parents to baptize their children, but our Pastor suggested it, and I'm glad he did. It was a really special moment for father and son and I hope that we have the opportunity to baptize our future children as well. Rhett did pretty well in church. 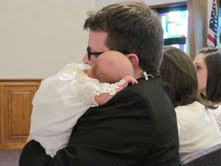 It was the first time we've brought him to church without having me wear him in his Moby Wrap, so I was a little apprehensive on how he would do. He was just a little fussy during the service, but he went to sleep pretty quickly. He also didn't mind the water being poured over him too much. He fussed and whined a little bit when it was first put on his head, but he was back asleep by the third shellful of water. What he DID mind was getting his picture take afterward. I don't know if it was the flashing cameras or the fact that he was getting passed around to half a dozen people, but he was really crabby for his post-baptismal photo shoot. He did much better after I got him home and changed and everyone dispersed for lunch. I don't know if this is any indication of his personality, but if it is, I'm thinking our kid is somewhat of an introvert. May 27th, 2012--Happy Baptismal Birthday Baby Boy!